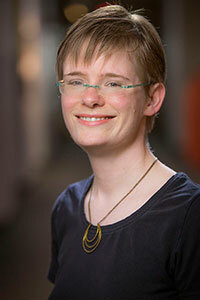 Dr. Abra Brisbin, assistant professor of mathematics, joined UW-Eau Claire in 2012. She earned her BA in mathematics from Carleton College and a PhD in applied mathematics from Cornell University. Previously, she served at Mayo Clinic in the Division of Biomedical Statistics and Informatics on research in statistical genetics. Her research focuses on the development of statistical and computational methods for analyzing genetic data. Along with Dr. Ursula Whitcher, Dr. Brisbin teaches courses on programming and data mining.